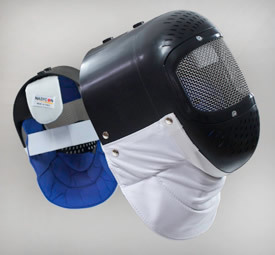 The NUMBER ONE purpose of all masks used in any form of fencing is SAFETY. Aramis masks incorporate many safety features unique to our design and not available from other manufacturers, such as non corroding stainless steel mesh and our adjustable double head restraint system. Our masks not only meet EC Safety standards but have also been extensively tested by independent test laboratories such as CRITT in France. You can therefore be assured that when you buy Aramis equipment safety has been a major considderation in its design. This has with doubt, been a factor in Aramis being THE equipment of choice of both the Italian and French federations for their extensive youth and school development programmes.